Presenting world class Pre-Inked Stock Stamp from Stamp Makers India. With the self-inking stamp from Stamp Makers India, avoid repetitive handwriting and clerical errors. A variety of stock messages are available or we can design one just for you. 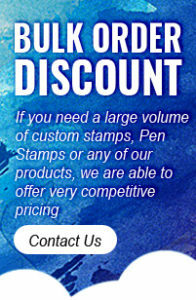 Features:- • Eminent Line Pre-inked Stamps use flash technology for excellent clear impressions. • Produced using only top quality inks and flash materials. • The ink is contained within the stamp assembly so no separate ink pad is required. • More than 12,000 perfect impressions before starting to fade. • Easy to re-ink for 12,000 more impressions. • Available in black, red, blue, green and purple ink. • any logo Can be made on stamp. Stamp makers India’s website is very user friendly and customers can upload their artwork and they can select ink color stamp body color and many more. Product is very good and fast delivery. Thank you. Fast service and perfect product. ! Dear Stampmakers, We all said in a meeting that your service is fast and perfect.... and product is very good.... Good Work thank you.